The Russell family lived in Doonagore, near Doolin. Micho spoke of his grandfather, Austin ‘Rua’ Russell, who was born in 1838, and who married Kate Flanagan. You'd get this gift from hardship and hard work and getting wet and cold weather. And lonesome lives. You'd learn the sad way, people living alone and maybe your relations to die. All that comes from that source ... 'It comes down out of the heavens in showers'. The gift of music. 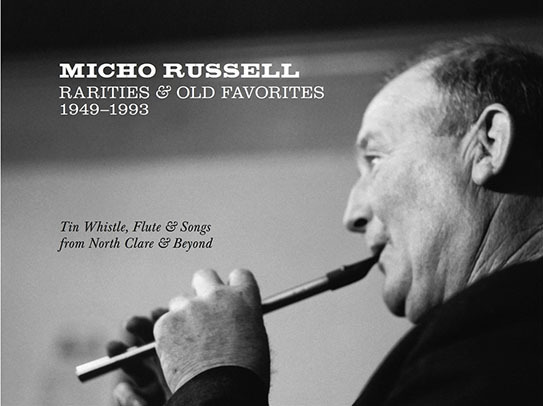 Micho Russell was one of Ireland ï¿½s best-known traditional musicians in the latter half of the 20th century. 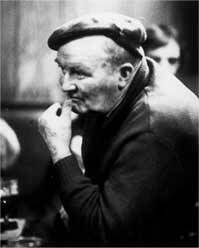 He was born in Doonagore, Doolin, Co. Clare where he lived all his life. He came from a musical family. His mother played the concertina and both his brothers, Packie, and Gussie played for house dances and later in the village pubs of Doolin. In 1973 Micho won the All-Ireland Tin Whistle competition. His style of playing was unmistakable for the variety and inventiveness in its ‘rhythmical ornamentation’ and surprising stops. In the naturalness of his performance and stage presence he created an atmosphere of rare rapport with his audience. It added an iconic Irish dimension to his act that had no precedent or equal on the concert stage. He enjoyed popularity and was much in demand from the 1970s onwards to perform at concerts and he toured all over Europe and the States. He was a patient and conscientious music teacher and he was a favourite at the Willie Clancy Summer School in Miltown Malbay. In later years, his life-long interest in recording background to tunes and folklore came to fruition in several publications. Micho died as a result of a car accident on February 19, 1994 . Doorty, John. 'Out of the Heavens in Showers: Play based on the life of Micho Russell. First performed in Kilshanny Hall Sept 1998 and later toured to many venues including the Town Hall theatre in Galway. The show was also performed at the Micho Russell Memorial Weekends in 1999 and 2000. The Russell Family of Doolin, Co. Clare; Micho, Pakie and Gusie Russell. Recorded by John Tams and Neil Wayne in O'Connor's Bar, Doolin January 1974. Published in 1975 by Topic Records. Under the Cliffs of Moher. Producer: Pearse Gillmore. Xeric Records. The Limestone Rock. Producer: Brian O'Rourke. GTD Heritage Recording Co. Ltd, Galway. Micho Russell, Traditional Country Music of Co. Clare. Producer: Neil Wayne. Three Reed. Ireland's Whistling Ambassador, Micho Russell. 1993. Producer: Bill Ochs. Pennywhistler's Press N.Y.
Producer: Bill Ochs. Pennywhistler's Press N.Y.
Includes forty-four previously unreleased recordings of Micho dating from his earliest recording at the age of thirty-four in November 5, 1949, when Sï¿½amus Ennis and the RTï¿½ Mobile Recording Unit visited Doolin to gather material for a radio broadcast. Russell, Micho.1980 .The Piper's Chair. A Collection of tunes, songs and folklore. Ossian Publications. Russell, Micho. 1986. The Piper's Chair No. 2 a collection of tunes, songs, and folklore. Photos and foreword by Dennis C. Winter. Canal Press, N.Y.
Russell, Micho. 1988. The road to Aran: Songs, Folklore and Music of West of Ireland. Micho Russell, Doolin. Russell, Micho. 1990. Doolin's Micho Russell A portrait of the whistler from Clare, his brother; Pakie & Gusie and their village. Text & Photos by Dennis C. Winter., N.Y.
Russell, Micho. 1991. Micho's Dozen Traditional songs from the repertoire of Micho Russell, Doolin, Co. Clare. Introduced and annotated by Tom Munnelly. Ennistymon Festival of Traditional Singing, Co. Clare. Russell, Micho. 1992. Music & Folklore of Doonagore - Doolin with Micho Russell. Micho Russell, Doolin.